At GlobusWorld 2018, we announced ongoing work to redesign the Globus web app. We appreciate all the input we have received since then from users who tested the new web app. Today we released a beta version of the new Globus web app, and are looking for feedback from all our users - that means you! Try it now by going to app.globus.org or clicking on the new banner in the current web app. We value your feedback as we prepare for the production release later this year. We had three primary goals in mind as we reimagined the web app: expose the full of range of Globus data management capabilities, improve the user experience on a wide range of screens (e.g. mobile devices), and expand the accessibility features. Over the past eight years, Globus has matured into a feature-rich data management service that goes well beyond reliable file transfer. 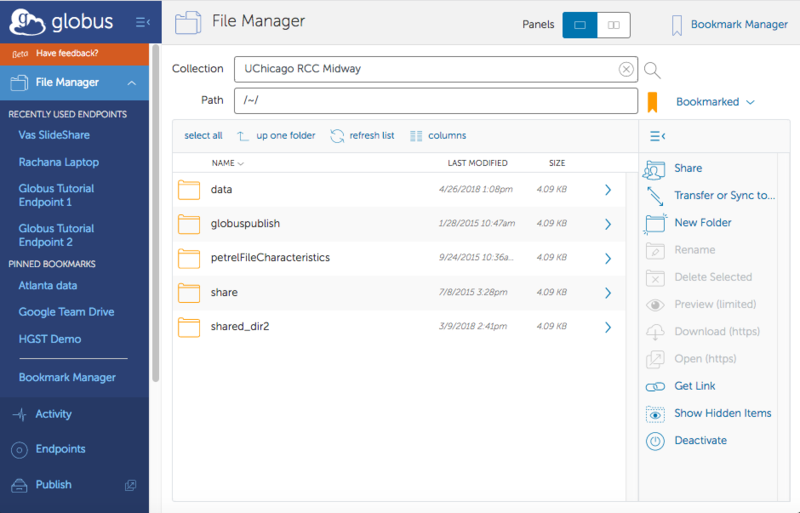 Perhaps the most immediately noticeable change that reflects this evolution is the introduction of the single panel file management window. The menu of options provides easy access to the broad range of capabilities available in Globus, including file sharing, file operations such as rename and delete, as well as ability to directly download, open, and preview of files via HTTPS. The app cleanly separates user-focused areas from administrator areas, and the menu on the left allows you to navigate easily to other areas, such as endpoint management, groups, activity monitoring, and account management. The new web interface adapts to the size of your screen, from large desktop monitors down to small mobile screens. Touch devices are also now supported. New accessibility features have been added to comply with established web standards, with an aim to become WCAG 2.0 AA compliant. Some accessibility highlights include higher contrast throughout the user interface to reduce eye strain, better visual cues through judicious use of icons, ability to resize text for legibility, and embedded text cues for use by screen readers. You will see some new terms in the webapp to support the architecture of the next major version of Globus Connect (version 5). “Collections” now provide the interfaces required to access data, while endpoints only have administrative interfaces for server management and configuration. Users log into collections for all data access, including transfer, and sharing. Try out the new Globus web app (app.globus.org) and let us know what you think – use the Beta Feedback link in the new app or send your thoughts to support@globus.org.